Azerbaijan is keen to support the cotton producers in the country to give a new life to cotton production industry. In this regard, the government plans allocate farmers preferential loans and participate in the formation of purchasing prices. Economy and Industry Minister Shahin Mustafayev made the remark while addressing a conference dedicated to the experience of Azerbaijan and Turkey in the development of promising areas of agriculture held in Baku on January 29. "When forming the purchasing price the companies should consider the world prices for cotton and devaluation rate in the country. We are in negotiations with these companies to propose more favorable prices for agricultural producers," he said. "It is necessary to facilitate access of cotton producers to the financial resources," Mustafayev added. Cotton production is traditionally wide-spread in the country's Saatli, Sabirabad, Beylagan, Barda and Zardab regions. Azerbaijan was famous for high production of "white gold" in the 20th century and was even a leading cotton producer in the Soviet Union. However, over the past 18 years, production has dipped six fold in Azerbaijan due to diminishing interest to this field of agriculture. As a result, areas grown under cotton reduced by nine times. According to the State Statistics Committee, Azerbaijan collected 35,000 tons of cotton in 2015, which is 14.6 percent less than in 2014. "This is the lowest indicator of cotton production in Azerbaijan since 2010," the agency noted. The average yield in the country stood at 18.7 quintals per hectare, which is 4.5 percent more than in 2014. The highest yield in 2014 was recorded in Yevlakh and Barda regions with a production of 34.1 and 30.7 quintals per hectare, respectively. Exporting countries have created an artificial market with low prices, which has hampered opportunities for selling Azerbaijani cotton. Depending on types of cotton, 1 ton of the product is received from a producer at a price of from 380 ($233.24) to 330 ($202.55) manats. Today, the cotton processing enterprises buy cotton from the Azerbaijani farmers at a price of 0.42 manats ($0.26) per kilogram, which is disadvantageous to farmers. Thus, low price is the main reason that hinders the development of the cotton production industry. Azerbaijani experts in agriculture say that cotton production is not the easiest operation, and despite the heavy demand, the decrease in interest in cotton resulted from the low profitability margins of cotton production. Moreover, an increasing use of artificial materials worldwide has negatively affected the cotton-growing sector. They believe that to boost this sphere, new technologies, minerals, and varieties are needed to lower the cost of cotton production. 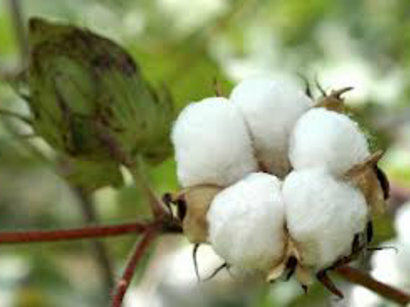 In this case, Azerbaijani cotton would be competitive in world markets. Earlier the Economy and Industry Ministry told Trend that the government will assist the farmers engaged in the cotton-breeding to purchase seeds, fertilizers and conduct agro-technical works. The volume of funds allocated to farmers and processing enterprises on preferential conditions will be increased as well. Allocation of funds allocated through the National Fund for Entrepreneurs Support under the Economy and Industry Ministry will allow decreasing expenditures on processing of cotton, and the enterprises will be able to purchase cotton at a higher price. Works in this regard are already underway.